Su doku is a logic game made popular in Japan. The puzzle is a 9x9 grid of cells in which you need to put nine sets of the digits 1-9 subject to the restriction that each digit must appear once in each row, once in each column and once in each 3x3 box. An initial configuration is given to you, and this cannot be changed. You need to use the logic of the restrictions to decide what values the empty cells can take. The initial configuration is usually chosen so that there is only one correct answer to the whole puzzle. You can read a guide on how to play su doku, and more information about the game at my su doku page. In my implementation, the controls are as follows: Create: creates a new initial configuration. Clear: clears the board so that you can enter a puzzle taken from elsewhere. Lock: locks the initial configuration so that you don't change it accidentally. Reset: resets the board to the initial configuration. Hint: makes suggestions for cells you might like to study - the program thinks that the correct digit for this cell is easy to find. Solve: displays the full solution, but only if you press and hold the key down! The darker coloured cell is the "current" cell. Pressing a numeric key or one of the numbered buttons on the right will enter a number in that cell. Click on a cell with the mouse, or use the cursor keys to change the current cell. The program prevents you from entering obviously incorrect answers, and plays a beep. However it will let you enter wrong answers that still fit with the visible digits. You can clear a single cell by pressing the space bar. Puzzles are generated for personal use only. They may not be published, distributed or sold in any form. 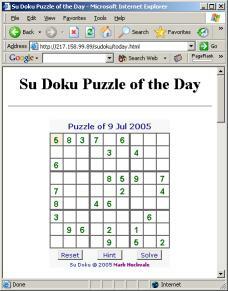 Run a su doku puzzle of the day on your web site for one small payment. for more information.